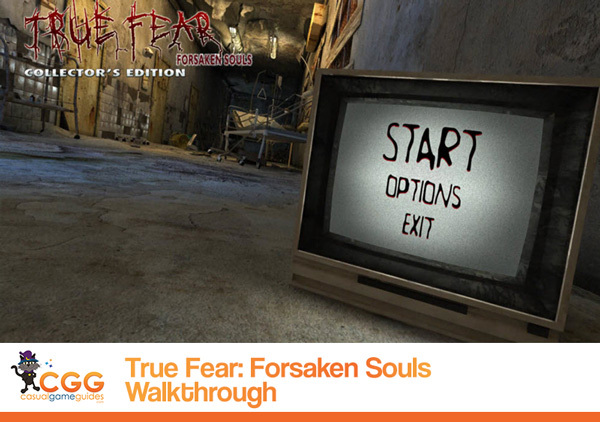 Our True Fears: Forsaken Souls Walkthrough is ready to hold your hand as you brave this dark and terrifying psychological thriller that gives new meaning to creepy. Rely on our detailed step-by-step instructions, custom marked screenshots, and our simple puzzle solutions to help you discover the truth about your past and the Dark Falls Asylum. Normally, I don't have a problem with scary... however, I do admit to a certain phobia concerning drippy haired little girls dressed in white, stalking around in the dark and near wells... yes, this may sound familiar to you if you ever watched the somewhat dated movie, The Ring. I don't know why... but for some reason, that image of her crawling in her dirty nightgown out of the well just messed me up completely. I had nightmares for weeks after watching that movie. And so, when I discovered a similar crawly creepy girl in True Fears: Forsaken Souls, I did what any sane person would do. I screamed. Loudly. I'd like to mention that I was in the hospital at the time, during one of my husband's chemo sessions. It was so embarrassing, I almost wished for a dark well to open up in front of me so I could sink in it and disappear... almost. Anyhow, I'm not really sure how I managed it, but I made it through the entire game... I guess it probably had something to do with the fact that this was a pretty exceptionally good game, despite the moments of terror.... and during that time, I did manage to put together a full True Fears: Forsaken Souls Walkthrough for you so you won't have to creep around in the dark by yourself like I had to do. From the moment you wake up in the middle of the night to the last terrifying seconds of revelation, we've got you covered with this True Fears Walkthrough. I've made sure to include every detail of my adventure with step-by-step instructions, custom marked screenshots, and solutions and hints to all the puzzles you'll encounter as you play. So don't freak out if you get to a part in the game that you just can't figure out or don't know where to turn to next... unfortunately, at times, it's going to be down that dark basement door with nothing but a lighter to show you the way... but at least you'll go down knowing you're not alone with our True Fears: Forsaken Souls Walkthrough at your side! Enjoy!